The Principality of Monaco was granted observer status in June 1956 and became the 183rd United Nations Member State on 28 May 1993. 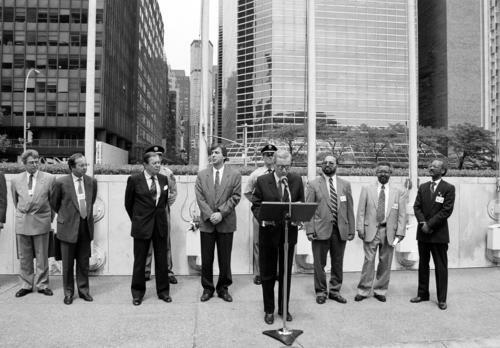 Joint flag-raising ceremony for Monaco and Eritrea on 28 May 1993. From left to right: Mr René Imperti Secretary-General of the Ministry of State, Mr Denis Ravera, Chief of Staff for the Minister of State; H.E. Mr Jacques Dupont, Minister of State, H.E. Mr Stoyan Ganev, President of the 47th session of the General Assembly, H.E. Mr Boutros Boutros-Ghali Secretary-General of United States and members of the Eritrean delegation. Since 1993 as Crown Prince and after His accession to the throne in 2005, H.S.H. Prince Albert II has regularly led the Monegasque delegation at ordinary and special sessions of the General Assembly. "The Prince represents the Principality in its relations with foreign Powers", as of article 13 of the Constitution of 17 December 1962, amended by the Act no. 1249 of 2 April 2002. 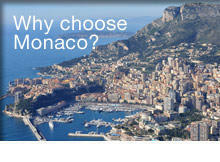 Monaco has a long-standing tradition of peace and is deeply attached to purposes and principles of the United Nations Charter, as international peace and security is the first objective of the Principality of Monaco. Through its Official Development Assistance, exclusively donations, and its voluntary contributions to a wide range of United Nations activities, Funds and Programs, the principality of Monaco is a dedicated international partner. Our main areas of focus are the realization of sustainable development and eradication of poverty, notably Human Rights, economic and social development, protection of the environment, issues relating to oceans and the law of the sea, Sport for development and peace and multilingualism. A national expert, Mr Bernard GASTAUD, is also serving a second term on the Committee on the Rights of the Child (2012-2015, 2016-2019).